Did you know that you can be smart with your air conditioner use during the Autumn season? The weather is the perfect time for you to become more energy efficient. After the hard work that it had to do during the hot summer months, it deserves to get a bit of rest. Not only that, this is the time to make sure that your AC unit is going to survive the coming winter. Fortunately, it is easy for you to become energy efficient during the autumn season. You can thank the cooler climate for that. When the temperature outside drops, the heat coming from the walls, windows, floor, and ceilings will decrease. That means your air conditioner does not have to work as hard as it used to. At least, not in the same way as it did during the summer. Your AC unit works to remove the heat from inside your home and moves it outside. Since there will be less heat to remove, your AC has a lesser load. The refrigerant, which is responsible for this, will have an easier time dumping the heat outside. This means it will consume less energy. You can expect a lower energy bill during the fall season. This is a welcome break after the high energy costs of summer and the incoming costs of keeping your house warm during the winter time. The climate itself will help minimize the workload of your air conditioner. But while autumn brings cooler air, it can still get hot during the day. That means you still have to use your AC unit. However, there are also other things that you can do to be smart about your use of it. Here are a couple of things that you can do. Since it is relatively cooler now, you might want to change the thermostat in your house by raising it by a couple of degrees. Your home will not be absorbing too much heat from the outside so you can afford to do this without compromising the comfort level at home. If the temperature outside is not too hot, you might want to keep the thermostat near the same level. It is important for you not to turn off the air conditioner. This will not make you save more – especially when you have to turn it on and off. When you turn on the AC unit after it gets too hot, it has to work harder to bring the temperature lower. If your thermostat has an automatic setting, make sure you use that. You can automatically set it so that the thermostat adjusts itself when there is nobody at home. Then, it can go back to the usual temperature just before you get home. There are also units that will automatically shut off when the room reaches a certain temperature. That means the AC unit will only run when it is necessary. You will not even notice it. That way, you will not get too cold or too hot. It will help you save energy and lower your bills. Heat rises. That means the warm air stays up in the ceiling. Having a ceiling fan can help move the air and make the whole room cooler. Turn your ceiling fan on during the hottest part of the day will help the air conditioner from working too hard to cool down your home. Since fans consume less energy than your AC unit, this should still help you save on your energy bills. The fall season brings a lot of leaves and debris. The wind and the fact that everything falls from the trees means it can be quite chaotic outside. You have to make sure that the outdoor unit of your air conditioner will not be blocked in any way. You do not want the airflow to be compromised because it can cause your unit to break down. Make sure you clean the surroundings by raking your yard always. You should also check the unit itself to ensure that there are no leaves or debris inside. 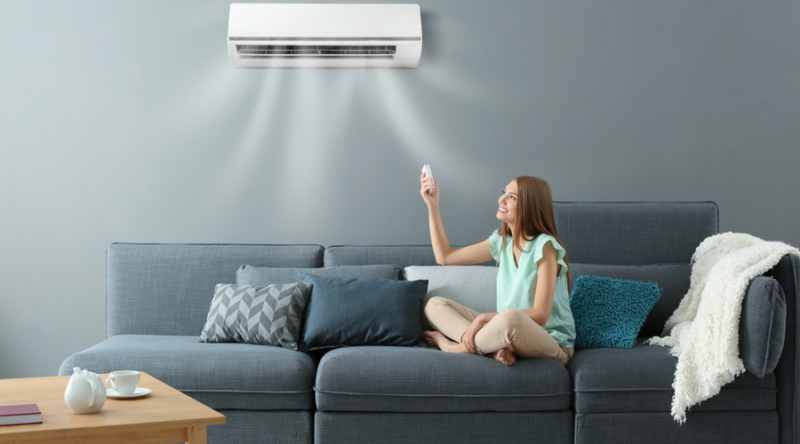 Follow these tips so you can be smarter with your air conditioner as you continue to use it during the fall season. You should also check it out so you are sure that it will not break down in the next couple of months.